Following its acquisition of Essex Auto Group (EAG), Super Group said it will look at further investments in the UK as it looks to add to the 23 dealerships it operates here and the 54 it runs in its native South Africa. Former EAG managing director Philip Maskell made the final exchange of contracts in the sale of the nine-dealership, £158 million turnover business which he has led for the past 27 years, at an emotional handover event attended by 270 of his 300 former employees. The deal sees Super Group add five Ford franchises (Southend, Rayleigh, Thurrock Lakeside, Billericay and Basildon head office), Kia sites in Southend and Thurrock Lakeside and Fiat and Mazda in Southend to its UK concern. Along with the Allen Ford operation acquired for £33.9m in October 2014, the acquisition of EAG takes Super Group’s total UK concern to 18 Ford, two Kia and two Fiat sites along with a lone Mazda site. In an exclusive interview with AM, Super Group’s chief financial officer, Colin Brown, described EAG as a “successful and profitable going concern”, but was unwilling to reveal how much Super Group had ultimately paid for it. He said the weak pound had benefited Super Group, with the South African rand’s relative strength increasing during the course of deliberations. “In that respect, the market played nicely into our hands,” said Brown. Combined with its fleet management and logistics businesses, Super Group’s turnover rose 15% to £8.9 billion in the six months to December 31, 2016. Super Group (UK Investments) is a wholly owned subsidiary of Bluefin Investments, both businesses registered in Mauritius. Philip Maskell and his brother, Peter, both leave EAG as part of the sale, along with fellow director Michael Brown. Colin Brown said Super Group “hopes to keep as much as we can of the existing structure”. EAG’s published accounts for year-end October 2016 show a turnover of £158m and pre-tax profits of £1.8m. Its return on sales was 1.1%. 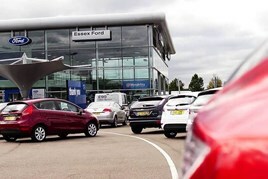 The group, which has its headquarters at a state-of-the-art FordStore and Transit Centre facility on the outskirts of Ford’s Dunton Technical Centre, saw vehicle revenues rise 9.1% to £144.9m (2015: £131.7m) on the back of 11,444 sales in the same period. Maskell, a former Ford dealer council chairman and the founding chairman in 2005 of the Retail Automotive Alliance, a buying group for franchised dealers, said the handover had been “an emotional affair”. “Over 270 of the business’s 300 staff turned up to the handover. They didn’t have to, but they all came along and said goodbye,” he said. Reflecting on his 44 years in the industry, Maskell said he was “very proud”. He said: “We have developed a world-class business led by our five Ford businesses in the heart of Ford country. “We are delighted with the strategic and geographic fit with Super Group’s existing Allen Ford operation and I am very confident that the fantastic team that I set up will continue to operate very successfully under the new owners.